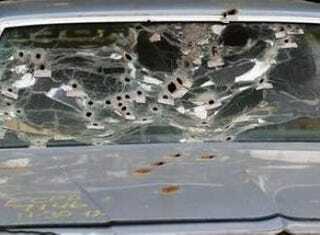 Cleveland Police Officer Michael Brelo climbed onto the hood of a car after a high-speed chase and fired his gun 49 times through the windshield at Timothy Russell, 43, and Malissa Williams, 30, both of whom were unarmed. Protests erupted in Cleveland Saturday after a judge found a white officer not guilty in the deaths of two unarmed black motorists who were shot at 137 times by police after a high-speed chase in November 2012, according to NBC News. Cuyahoga County judge John P. O’Donnell on Saturday found Michael Brelo, 31, not guilty on two counts of voluntary manslaughter and felonious assault, the report says. He remains on unpaid suspension while officials consider administrative charges against him, the report says. O’Donnell said the shootings were justified because Brelo believed that someone in the car containing Timothy Russell, 43, and Malissa Williams, 30, fired shots when the car backfired as it sped past Cleveland police headquarters, The Guardian reports. After the car stopped and the passengers were no longer a threat, Brelo climbed on the hood of the car and fired his gun 49 times through the windshield at the unarmed couple. A total of 13 officers fired 137 shots into the car in 18 seconds, The Guardian says. The judge’s ruling prompted about 150 protesters to march down the middle of downtown Cleveland, temporarily blocking intersections as they chanted anti-police slogans and carried a large banner that read, "Stop Murder by Police," Fox News writes. Police in riot gear made 71 arrests Saturday, Fox says. Police tweeted that they arrested a male for assault after he threw an object through a window, and the Northeast Ohio Media Group reported that three people were arrested near the Quicken Loans Arena, while officers showed protesters cans of pepper spray as they approached those being arrested. Some police were wearing riot gear. The Department of Justice said Saturday that it plans to "review all available legal options," according to Fox. Vanita Gupta, head of the department's civil rights division, said the review is separate from its efforts to resolve a pattern of civil rights violations at the Cleveland Police Department, the report says. In December a report outlined a string of examples of excessive force, including officers who unnecessarily fired guns, hit suspects in the head with weapons, and punched and used Tasers on people already handcuffed, notes the television news site. Twelve-year-old Tamir Rice was shot by a Cleveland officer in November while playing in a park after police received a report of a man with a gun. Surveillance video shows the officer shooting Rice just seconds after his patrol car arrived at the scene. Read more at NBC News, Fox News and The Guardian.